Haruhi is God. . Wallpaper and background images in the anime debat club tagged: anime haruhi suzumiya. The only being in existence that could defeat Haruhi Suzumiya is Kamijou Touma, through a plot device war. 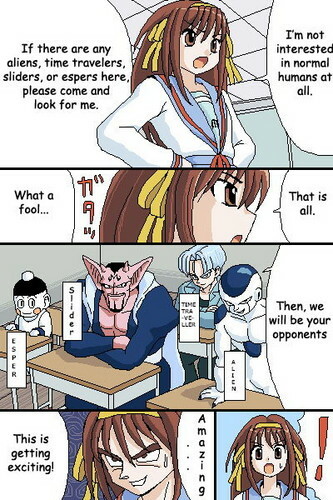 Anyone else would be unable to win because Haruhi would view them as weaker than her, and would immediately be so. Don't you dear ever underestimate the power of Haruhi Suzumiya.Don't ever underestimate the power of Haruhi Suzumiya. Or its the closed space. And the Shingin giant blue creatures you will have to deal with. So never and i reapeat never Underestimate the power of Haruhi Suzumiya. Or thats it for you!!. And i mean it. Dead serious about this!. Plus haruhi Suzumiya has GOD like power. All haruhi Suzumiya has to do is. Uses her GOD like power to change and take away every DBZ characters power and turn them into normal humans. Than haruhi Suzumiya will lay the smack down on them all! !.